Access clips and outtakes from THE JEWISH AMERICANS. Exclusive Outtakes! 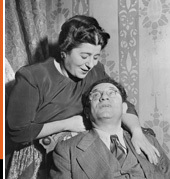 Learn about the history of being Jewish in America through video clips and book excerpts. Share treasured stories or recipes and build your very own family tree. Please see the Broadcast Schedule for dates and times to watch THE JEWISH AMERICANS series in your area.